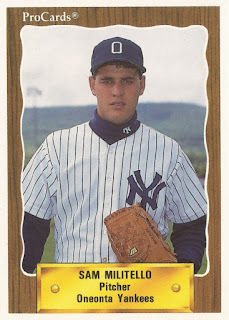 Yankees manager Buck Showalter was impressed with Sam Militello's start with the club in August 1992, according to The Associated Press. But he also wanted to see if Militello could keep it up. In Militello's major league debut - against Boston no less - he went seven innings and gave up a single hit. In his second start, Militello went eight innings, giving up two earned runs. "I'm a realist. Success is measured over the long haul, not a short-term basis," Showalter told The AP after that second Militello outing. "He is certainly off to a good start and we'll see where it takes him." That good start ended up taking Militello seven more starts that year and three more outings the next. Those outings ended up being the extent of his major league career. For Militello, the actual long haul ended up not being as a player, but as a coach. He's served 16 years as a coach for his alma mater the University of Tampa, continuing in 2015 as associated head coach. Militello's career began in 1990, taken by the Yankees in the sixth round out of the University of Tampa. Militello started with the Yankees at short-season Oneonta. In 13 starts, he went 8-2, with a 1.22 ERA. He continued his success in 1991, posting a 1.57 ERA between high-A Prince William and AA Albany-Colonie. Militello played 1992 at AAA Columbus, going 12-2, with a 2.29 ERA. It was that August that Militello got his call to the Bronx. In his debut, Militello had that debut against the Red Sox where he went seven scoreless innings, giving up one hit. "Once I got started, I focused everything out," Militello told reporters afterward. "Once you scored the three runs in the first, I just tried to do my job." 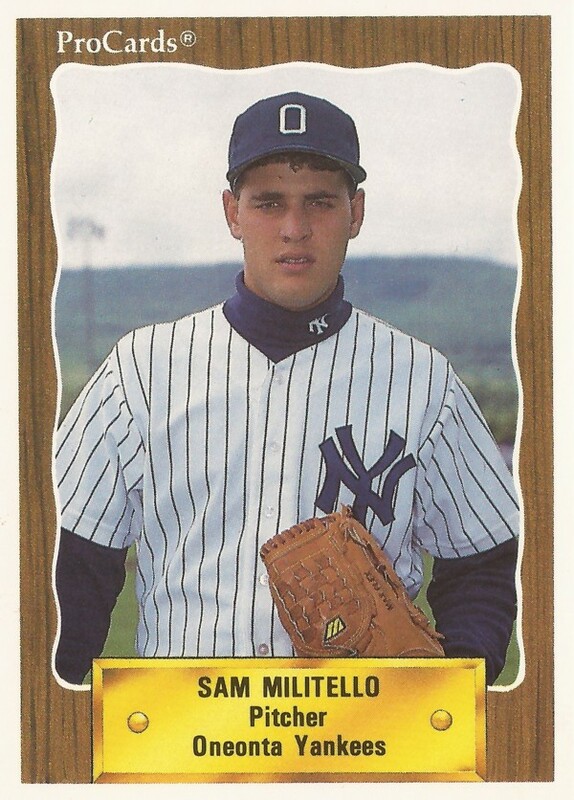 Militello went on to start nine games for the Yankees that year. He ended with a 3.45 ERA. He then returned for 1993, but for just three outings, two starts. He gave up seven earned in 9.1 innings, ending his major league career. Militello continued playing in the minors into 1996, his final three seasons were each brief. He didn't start more than for games in each. Militello soon started his coaching career. He coached in the Devil Rays system in 1997 and 1998, then the Indians system in 1999 and 2000. By 2001, Militello was coaching at the University of Tampa, where he remains for 2015.